Options for backing up, restoring, and syncing Outlook data appear at the bottom of the Smart Switch window. Business owner, web designer, and social media marketer who is the author of over 30 computing books and a developer of computer training courses. 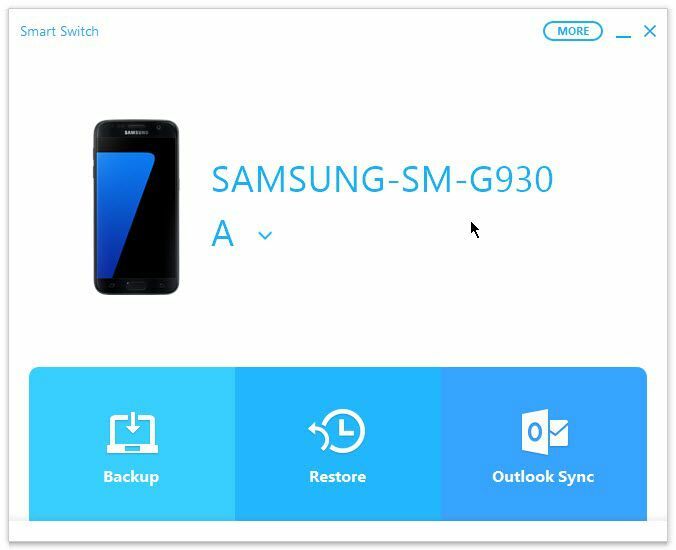 The Samsung Smart Switch application makes it easy to back up data to your computer and restore that backed up data to your Samsung smartphone, tablet, or phablet. You'll need a device made in or after 2016 and be running Android 6.0 (Marshmallow), Android 7.0 (Nougat), or Android 8.0 (Oreo). Here's what to download and install, plus tips for using Smart Switch. The Smart Switch Mobile app is already installed on Samsung Galaxy smartphones and phablets, but you’ll have to install the app on your Galaxy Tab tablet from the Galaxy Apps store. You’ll also need to download and install Smart Switch for your Windows PC or Mac from the Samsung website at www.samsung.com/us/support/smart-switch-support/. After you install Smart Switch onto your computer, you can use Smart Switch to match your media files between your smartphone and your computer. Connect your smartphone or tablet to a USB port on your PC or Mac. Launch Samsung Smart Switch on your computer. If Smart Switch doesn’t find your smartphone or tablet right away, disconnect your smartphone from your computer and then connect the smartphone or tablet into the USB port again. If you see a pop-up window that states that the device reset function is no longer supported, this means you can’t reset your smartphone or tablet from Smart Switch. Close this window for good by clicking on the Do Not Show Again checkbox and then click the Confirm button. Don't worry: you can still use Smart Switch to back up your Samsung device data to (and restore the data from) your computer. You may also see a message that says, “USB file transfer is not allowed.” This is not a big deal. All you have to do to enable the file transfer through your USB cable is tap Allow in the pop-up window on your phone to allow the transfer. The Samsung device name appears in the center of the screen. The backup progress bar keeps you apprised of how much data has been backed up. In the Allow Access window on the smartphone or tablet, tap Allow. After the backup process is complete, you see a summary of the data that was backed up. Click OK.
You can see what types of files have been restored from your computer to your smartphone or tablet. Restore the most recent backup by clicking Restore Now. If you want to select a different backup to restore, go to Step 2. Click Select Your Backup Data and then select the date and time of the backed-up data in the Select a Backup to Restore screen. Click OK. On your smartphone or tablet, you may have to restore some features such as the data within the Weather widget on the Home screen by tapping Tap here to restore weather data. You can synchronize all your contacts, calendar, and to do information, or you can sync specific folders. Click Sync Preferences for Outlook because so far you haven’t specified what Outlook data you want to sync. Click the Contacts, Calendar, and/or To Do checkboxes. By default, you select all contacts, calendar, or to-do items. Choose one or more folders to sync by clicking the appropriate Selected button and then clicking Select to open the appropriate window and choose the folder. When you’re done selecting your folder(s) to sync, click OK.
Start syncing by clicking Sync Now. Now you can check the Contacts and/or Calendar apps on your smartphone or tablet to ensure the inclusion of your contacts, calendar, and/or to-do lists from Outlook. The five menu options for performing more tasks with your smartphone, tablet, and Smart Switch. Recover and initialize the smartphone or tablet system software. Get online help for using Smart Switch. Read the current version and license information. When you’re done using Smart Switch, close the program by clicking the Close icon.